“God” being the first US single for Under the Pink, the video was shot the same week as the “Cornflake Girl” European video, which was the first UK single for the album. The idea to represent ritual of different traditions was from director Melodie McDaniel, who had researched the subject in depth and even shown a documentary about the East Indian ritual involving rats to Tori. 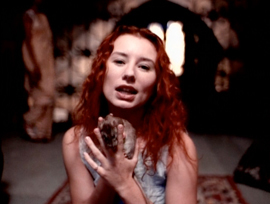 “…she showed me this documentary of, um, this certain section of India where this is a happening: the rats do run freely in the mosque, and, um, when the rats run on you, you’ve been blessed [because the god Dharnish travels on the rats],” she explained to First Cut. “Surprise, surprise, but you have been, it’s a sacred happening. And so when she showed it to me, she showed me documentary footage, I was like, ’Melodie, this is hot.’ And she goes, ’Yes, it’s very hot. Do you have the guts to do it?’ I said, ’Yeah, just make sure that, you know, they’re clean.’"
And as a matter of fact, Tori had around 140 rats on the set that went about and crawled over her while she lied down on the ground and sang. It didn’t matter to her, even though she admitted she smelled like a “rat sewage plant” by the end of the day and when she had to handle the snakes to represent a Fundamentalist Christian ritual, the rats thought she was “one big rat.” Karen Binns, Tori’s stylist, had more of a hard time with them, however. “[She] was threatening the rats. I caught her, you know, when the rat catcher wasn’t looking... and she was, you know, saying, ‘You get anything on my garment, and I’m just gonna...’ It was ridiculous,” she told in the audio commentary of the video on Fade to Red. These rituals of course have different meanings but they’re all about faith in something bigger, higher… with the dangers it represents. Drug addiction is a disease that destroys the persons addicted while dancing with rattlesnakes as a mean to “calling forth the holy spirit within the snake dance” as the Fundamentalist Christians do is very likely to make you killed - which is what happens at the end of the video; a man is bitten by his snake and collapses on the floor while the other people around him watch. Of course, the snakes that were used on the set were not rattlesnakes. “I didn’t use Rattles because...well you know, it could be bad and because, you know if Jesus is busy, I’m really in trouble," Tori witfully said to WFNX on March 1994. While the shaving scene was part of a ‘ritual’ (beauty ritual), Tori admitted that it also allowed her to clean herself a bit after having rats crawling over her for hours. Tori also said she liked the snakes more than the rats during the shooting. About the visual parallel between the junkie wraping up his forearm to inject his dose and the Hasidic wrapping ritual, she mentionned that it wasn’t meant to be taken at the first level but more as an art form because the black bands look quite similar but it’s two different ‘rituals.’ “Obviously there’s always a p.s. to this — not everyone will see the art form in us pairing the junkie with the Hasidic wrapping ritual," she thus wrote in the Tori Stories promo booklet. Alternative Nation, MTV, March 1994. Tori Stories promo booklet, 1998. “God” audio commentary by Tori on Fade to Red, Rhino Records, 2006.